Colombia is currently in the midst of ending one of the longest civil wars in the world and has been submerged in violence for long before its commencement. Since its independence in 1810, the country has been immersed in a turmoil of violence. Colombia is a rich country in terms of land resources, i.e. oil, coal and precious metals, and has one of the most fertile soils in the world. But in the last century, most of Colombia´s natural wealth has been controlled by a small minority, for example “less than 1% of the population owns more than half of Colombia’s best land” (“property rights…”, 2013: 1); the politics of the country and its media have suffered a similar fate. For over 50 years, Colombia has been at war, a war for land and political inclusion (among other), and in the process, it has been shattered by left wing guerrillas, right wing paramilitaries, death squads, hired killers, corrupt security forces, drug cartels, oligarchy, massive inequality and poverty, and an alarming rate of internally displaced persons (“property rights…”, 2013: 1; Coatsworth, 2003; “Colombia’s killer networks”, 1996; Dent, 1974). The violence further escalated in 1964 when a group of peasants organized against the government and became what is now known as the FARC (Fuerzas Armadas Revolucionarias de Colombia, Revolutionary Armed Forces of Colombia). Their financing methods range from kidnapping for ransom, to drug dealing and illegal mining. Yet their endurance has not only been fueled by their access to various natural resources, but also as a result of the state´s lack of control over Colombia´s vast territories (Guáqueta, 2003: 78). Attaining peace with insurgent groups proves to be a very difficult task; according to some, in the case of Colombia, previous peace negotiations have failed because of the FARC´s lack of interest in ending the war that stemmed from their deep involvement in the illegal economy, which made them one of the richest guerrillas in the world (Murphy and Acosta, 2013). They, for example, have often used peace negotiations as a political tactic to rebuild and recollect themselves instead of as a serious attempt to achieve peace (Guáqueta, 2003: 76). In addition, the fact that presidents (and their views on the matter) change every four years seems to be quite obstructive if the next president disagrees with the arranged settlements. This was the case with the taking of power of president Álvaro Uribe, who after various failed negotiations, decided that a military defeat was the best way to end the conflict. He did not see the guerrillas as a political problem, but as a criminal one, and sought to end them in this manner. However, as Shibutani (1986: 496) mentions, guerrilla units are difficult to defeat through military operations alone. They ought to be robbed of their base of operations, which in Colombia means hindering their access to natural resources; otherwise, they can continue their activities for a long time. Nonetheless, the military defeats that the FARC experienced during the Uribe administration have substantially diminished their military and economic capacity, yet several social scientists estimate that both sides have enough resources to continue fighting for a very long time (Guáqueta, 2009: 74). Nevertheless, the FARC initiated peace negotiations with the government of Juan Manuel Santos in 2012; their engagement in the current peace negotiations seems to have surged out of the recognition “that the opponent can neither be tricked, nor coerced…” so “… both sides settle down to negotiate in good faith, each seeking the best bargain possible under the circumstances” (Shibutani, 1986: 406). In general, conflict is (in the social sciences) understood as inherent of human nature. What is not a “normal” feature however, is the escalation of such conflict into severe violence. Social scientist Shibutani (1986: 400) mentions that rivalry and conflict are not reactions to objective conditions but that they rather arise from the definition of the situation. In other words, only when people feel oppressed (in the sense of Marx´s class conscience) can they act against the oppressor, and this is exactly what the FARC has tried to do: they saw themselves as oppressed by the political exclusion and oligarchy of Colombia. In the field of political science, many authors have focused on trying to answer questions such as how to prevent violent conflict, how to end it when it breaks out and why it surges. 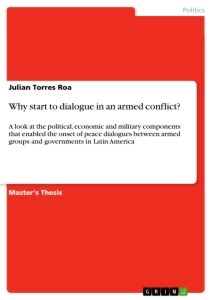 In this thesis, I will focus mainly on analyzing internal armed conflict and reviewing the prospect of ending violent conflict through political dialogue, which, in a country in which violence has been the main mean of asserting political power, proves to be a great struggle. Signing an agreement with the FARC could have vast implications for Colombia and neighboring countries. In the case of Colombia, as will be exemplified later, the drug economy was born out of the armed conflict (Ross, 2004: 345), thus, the possibility arises of substantially diminishing the drug production parallel to ending the conflict. Demobilizing and disarming FARC members would not eliminate the drug trade in Colombia but it would considerably reduce it, consequently allowing the country the possibility of utilizing government funds for development instead of using these on the “war on drugs”. However, most important, ending the conflict could give way to a new political dimension in Colombia in which the opposition is not killed, but fought through political competition. It has the potential of changing the politically exclusionist and oligarchic system that Colombia has been caught up in since its independence. Also, even with no agrarian reform, the laws regarding land property (which is a controversial area in Colombian politics) are supposed to change dramatically if an agreement is signed and would thus become more just. Finally, it presents a real chance at ending the violent legacy of Colombia and finally establishing the idea that politics is not inherently a bloody, violent ordeal. In summary, Colombia has been chosen as the unit of analysis as it represents one of the longest ongoing civil wars in history. One that has created a massive humanitarian crisis, positioning Colombia as having one of the world´s largest numbers of internally displaced persons in the world (“worldwide displacement…”, 2015). The conflict has created a drug market that is internationally relevant and has been directly responsible for the creation of other violent groups. The world´s illegal economy has been profiting from Colombia ever since the beginnings of the conflict and ending it might prove profitable for the war on drugs. Ending the conflict with the FARC might also lessen other problems that Colombia is facing and might give way for development in the country and outside its borders, as well as help better their international relations. Furthermore, if successful, it might give us insight in the aftermath of such a multidimensional dispute, it might provide us with information as to whether a drug economy that surged out of armed conflict can also fade with the elimination of such, and it can teach us much about the post conflict phase. An in depth analysis of the peace negotiations thus, seems important, especially while in the midst of negotiations that appear rather promising. This thesis identifies and analyzes different factors that may affect peace negotiations. Given the history of failures in Colombian efforts for peace, and that there are current negotiations between the largest guerrilla group and the government, it is important to identify determinants that may have damaged past attempts and thus may pose a threat to the current ones. In order to do this, the literature on peace agreements and conflict will be examined and the most important factors will be singled out. With these chosen factors/determinants as a theoretical basis, the negotiations between the Colombian government and the FARC will be analyzed using process tracing. The analysis focuses on conflict resolution techniques in internal armed conflicts. Not only will the objective factors be analyzed, but the socio-psychological effects that these have as well, thus providing a more rounded image of the multidimensionality of armed political conflict and a more detailed understanding of the Colombian case. Moreover, in the social sciences we observe that academia focuses more and more on the causes and effects of internal armed conflict. In addition, what seems to be evident is that it mostly happens in developing countries and that the link between armed conflict and poverty is strong (Podszun, 2011: 22). However, it is still hard to say how the causal arrow flows. Nonetheless, it is important, when trying to grasp the causes and effects of internal armed conflict, to take into consideration the many aspects that shape it. Consequently, a well-rounded study must include sociological considerations of how society is affected by poverty, development aid, political conditions etc. Moreover, especially when analyzing Colombia, one has to take into account the social psychological effects of such a long war regarding trust between the parties and reconciliation. And on a more political level, the organizations and institutions that work towards this direction must also be examined, as well as the specific processes in these institutions (such as corruption) that hinder any positive developments. The first chapter of this thesis builds the conceptual and theoretical framework necessary to conduct the analysis. Then, the key terms will be defined and explained: conflict, conflict resolution, peace agreements. This chapter also includes a literature review about relevant determinants that may help explain the armed conflict in general but that remain relevant for the Colombian case. The second chapter provides a more detailed analysis and explanation of the Colombian conflict where key actors are listed and introduced, as well as a general overview of the history of the conflict, including all of the attempts to negotiate with the guerrillas up to date – not exclusive of FARC negotiations. Then, the methodological approach will be presented and clarified. The third chapter includes an in depth analysis of those negotiations that have been undertaken between the Colombian government and the FARC up until today. Given that only three presidents have, since the commencements of the FARC, been involved in peace negotiations with them, only these three negotiations will be taken in to account. This will be separated into three parts, one president respectively. Within each case analysis, every chosen determinant will be examined as to try and figure out if any of the involved risks surrounding this specific determinant were/are present. Ultimately, the goal is to analyze in detail and compare the three attempts to negotiate with the FARC to see where the similarities lie, what the obstacles and the effects of these obstacles were and what is being done differently. In short, all three negotiations will be examined to see if the factors that hindered previous negotiations pose a risk for damaging the current one. Finally, this thesis ends with a large conclusion chapter made up of detailed conclusions of each presidential term. These summarize the key findings of the analysis in a clear manner. The conclusion also refers to implications and limitations of the study and identifies avenues for further research. This chapter aims to establish a conceptual framework and to discuss theoretical issues related to the success and failure of peace negotiations. The first section explores key concepts, terms and ideas that constitute the building blocks of this thesis. The second section, which aims to create the theoretical framework of this thesis, explores the effects of certain determinants on war and peace negotiations, reviewing earlier research on the topic. Before commencing the actual analysis, this section provides an overview of the used terminology. It is structured around the term “conflict”, touching upon various related aspects and defining individual terms as well as concepts. The aim is to create a basis of definitions for further analysis. The etymology of the word conflict comes from the latin word “confligere” which means to “clash” and “bang together”. Within the social sciences, it seems rather difficult to find a proper definition of conflict in a single sense. Rather, conflict has been defined in various ways depending on the author and his/her purposes, and relative to the actors involved in the conflict. In its most basic form, conflict can be defined as a social process (Podszun, 2011: 65), a phenomenon that “exists when two or more parties have opposed views about how some social situation should be organized” (Nicholson, 1991: 59). Authors, like Washmut (in Bonacker and Imbusch 1996: 68-69), argue that it is imperative to view conflicts objectively and as social facts as to avoid confusing them with the method in which they are settled; to not limit them through evaluation and to not confuse them with their causality. She defines conflict therefore as a social condition, in which at least two parties (individuals, groups, states etc.) are involved who (a) pursue different, incompatible aims, in relation to the originating point, or who pursue the same aim, but one which can only be achieved by a single party and/or (b) who attempt to use different, incompatible means, in relation to the originating point, in order to achieve a specific aim. Even though this proves to be a more detailed definition, it still does not reveal much about the actors involved or the intensity of the conflict. In the political context, conflict is defined in accordance to its intensity (Podszun, 2011: 65). “ Political conflicts are those arising out of challenging and uneven distribution of power relational, religious and cultural power ” (Cloke, 2005). The type of conflict that this analysis is concerned with arises out of an uneven distribution of power, for which it can be classified as a political conflict. Moreover, it displays a level of intensity, at which the social process has escalated into violence – and in which violence has become the status quo. The situation relates to the definition of war given by Clausewitz in 1832, which states that “war is an act of violence intended to compel our opponent to fulfill our will” (Clausewitz in Podszun, 2011: 66). He also emphasizes that war is composed through an ongoing sequence of events and can never be composed of only one single event; thus differentiating between war and terrorist attack. Another important differentiation to be made is on which level the conflict is playing out. Ahlbrecht et al. (2009) have identified different levels of conflict. The first one being at an individual level (intra-personal), focuses on analyzing human nature and recognizes the reasons behind human aggressiveness as conflict originators. The second level of conflict plays out in the realms of society and domestic policy in which the nature of social structures and the distribution of goods (material and symbolic) are seen as the reason behind various interpersonal and group-intern conflicts. Furthermore, the authors identify another level of conflict, which plays out in the realms of the international system. This level focuses on conflicts occurring between states within the anarchistic international system (with no central judicial power instance). The debate on this level focuses on the question of whether conflict, the use of violence, and war are part of a necessary relationship within the structure of the international system (Ahlbrecht et al., 2009: 31). Important for this analysis is the differentiation made by these levels into international war and internal militarized conflict. International wars, such as those seen at the level of international system are characterized by “military action between two or more parties, in which the primary belligerents are state-actors” (Podszun, 2011: 66); whereas internal, intra-state, or civil war refers to a conflict within a state which usually comes about in the levels of society and domestic policy as well as on the governmental level. Another differentiating characteristic refers to the actors involved: in an international war, the primary actors are state-actors whereas in internal conflicts only one of the parties is a state-actor (if any) (Podszun, 2011: 66). Even though one could argue that the line of separation between international wars and internal conflict is becoming more and more blurred, this analysis will work with an actor-oriented definition of conflict, which plays out in the intra-state level. Thus making it a political internal conflict, with occasional spillovers beyond the border. Jahn (2012: 31-41) distinguishes between four types of conflict. He differentiates between 1) constructive and deconstructive conflict; 2) armed conflict and war; 3) physical violence and conditions of structural violence; and 4) politically motivated mass murder. He argues that conflict is an inherent part of society, which is, more often than not, classified as negative. There are however, certain conflicts that aid in the development and progress of society – these are considered constructive conflicts (such as those that lead to political competition in the form of elections etc.). Deconstructive conflicts contrariwise are those which destroy and eliminate parts of society, nature and man-made things; for instance physical aggression (against other humans, living creatures, the environment and/or things; and structural aggression (hunger, poverty etc.). Jahn (2012: 31-41) also refers to a different type of conflict, namely: politically motivated mass murder, which is carried out by both political parties and organizations, in a systematic way by state administration, and/or by police and military. Finally, the last category is armed conflict and war in which war is defined as an enforcement of policies to maintain or to change a community. The decisive aspect of war is that both of the warring sides use weapons. In its classical understanding, war is not seen as a solely political act, but also a political instrument, a continuation of political performance with different means (Clausewitz 1980: 34 in Jahn, 2012: 33). One generally refers to war when there are at least 1000 deaths due to battles; the others are referred to as armed conflicts (Jahn, 2012: 34). According to a study by the Colombian government, over 220,000 have died because of – and during – the now over 50 year- war (“Report says…”, 2013). Regardless, I will refer to terms such as “war” and “armed conflict” interchangeably – they will not differ in meaning for this analysis. Other terms that will be used likewise are “armed” and “militarized”, and “insurgent” and “rebels”. As stated above, conflicts can also generate prosperous effects which shows that conflicts are not fundamentally bad; the problem however befalls when conflicts turn violent – bringing with it a need for resolving them. Conflict resolution refers to the act of trying to resolve a conflict. Miall et al. (1999: 219) define conflict resolution as a term which implies that the deep-rooted sources of conflict are addressed, and resolved. This implies that behavior is no longer violent, attitudes no longer hostile, and the structure of the conflict has been changed. The ambiguity of this term/definition is evident because it refers both to the process (or intention) to bring about these changes, and to the completion of the process; for the purposes of this thesis conflict resolution will be understood as the attempt to resolve a conflict. Moreover, conflict resolution many times implies some sort of “mediation” which is defined as “a negotiation between belligerents with the support of a third party” (Podszun, 2011: 71). Ultimately, both through mediation and conflict resolution, the warring parties aim to reach a peace agreement. “Peace agreements are contracts intended to end a violent conflict, or to significantly transform a conflict, so that it can be more constructively addressed.” (Yawanarajah and Ouellet, 2003). Some understand peace agreements as having one of these three potential meanings: “formal agreements (treaty, armistice, and ceasefire), semi-formal agreements (letter, oral declaration), or tacit understandings (mutual understandings by adversaries, neither stated nor written)” (Wilkenfield and Young in Podszun, 2011: 70). For the purposes of this analysis, peace agreements will be defined as formal agreements that intend to transform a violent conflict into a peaceful process of social and political change. Finally, peace will be understood as the absence of war. Müller notes that “a narrow definition of the word peace which concentrates on the absence of physical violence (…) offers practical advantages for the research and is normatively legitimate” (Müller in Podszun, 2011: 72). In light of Müller´s observation, the definition of peace used for this thesis will remain the formerly mentioned. Note that I use the term war instead of physical violence. Given that the violence in Colombia is multi-leveled (drug dealers, criminal organization, political murders and other guerrillas beside the FARC), it is very hard to talk about peace in Colombia in terms of a lack of violence. Peace will therefore be defined (for the purpose of this analysis) as the absence of war rather than the absence of physical violence. The purpose of this sub-section is to create a theoretical framework consisting of the effect that various determinants have on war and henceforth on peace negotiations. With this framework I intend to explain the consecutive failures of the peace negotiations between the Colombian government and the FARC. Lootable resources (defined as resources that can be easily appropriated by individuals and small groups of unskilled workers) appear to prolong non-separatist conflicts because they tend to bring benefits to the rebels. If the resource is also illegal, it is even more likely to benefit the rebel side. Also, it creates discipline problems within the group as it becomes challenging for a commander to impose the terms of a settlement – this, consequently, also prolongs the conflict. A third possibility arises too: “the wartime resource exploitation will become so profitable for rebels that they prefer war to peace” (Ross, 2003: 59). In general, when the resources are lootable, the revenue almost always goes to the weak side, whereas when the resources are unlootable this tendency does not appear so noticeable. However if the unlootable resources (e. g. oil) are obstructable, the tendency will most likely be that the weak side profits from it. In such cases the obstruction of unlootable resources also aids in increasing the duration and intensity of the conflict (Ross, 2003: 59). Collier and Hoeffler (cited in Humphreys, 2005: 511) argue that domestic groups may engage in such criminal activities with the purpose of benefiting from resources independent from the state. This in turn leads to a local expulsion of the state, as has been the case in Colombia. Moreover, it is not required that the rebels control the resources directly, it might also be enough to demand “rents” from those who do, as has been done in for example Colombia and Nigeria. Fearon and Laitin (in Humphreys, 2005: 511) contend that finance through natural resources might also increase the “prize” value for capturing the state. All in all, revenue through (illegal) natural resources makes war longer as it enables to keep combatants alive and fighting, protect assets and inflict damage to the opposing side (Humphreys, 2005: 514). Ross (2004: 49-50) in his article “How Do Natural Resources Influence Civil War?” gathered evidence from 13 different case studies and found that resource wealth made conflict more likely in five of the thirteen cases; and in eight out of the thirteen he found that resource wealth made conflict last longer. In a different article: “What do we know about Natural Resources and Civil War?”, Ross (2004: 344-345) notes that civil wars are usually linked to lootable commodities: “between 1990-2000 civil wars occurred in five diamond producing states, three major cannabis-exporting states and two leading coca-exporting states”. He concludes that, in many cases, narcotics had little to do with the initiation of the conflict, and even in some cases (Colombia, Burma) the causal arrow ran in the opposite direction: civil war lead to drug production by creating a region that was outside the government’s jurisdiction. This lack of government jurisdiction, as well as illegitimate, undemocratic or inefficient states are known to be underlying cause of conflict. The deficiency of governing and state institutions, an absence of legitimacy, and a lack of governing capacity for example, pose great challenges for peace negotiations and peace implementation (Ahlbrecht et. al, 2009: 22). In addition, a shortage of state presence in rural areas has a direct impact on the rebel groups, mainly because it facilitates their operations (Nasi, 2006: 223). Moreover, the absence of a functioning judicial and law enforcement system can exacerbate the conflict by granting impunity to continued acts of violence and thus jeopardizes the security situation (Yannis, 2003: 186). Yet a “functioning” law enforcement system can also aggravate the conflict when the application of laws by both the judiciary system and security forces is of partisan nature (Ahlbrecht et. al, 2009: 22). In these cases protection against human rights abuses as well as effective measures to address past abuses are disregarded – both of which are crucial components for achieving a just and lasting peace, according to Amnesty USA. Furthermore, criminality, social and political violence as well as a lack of (or decrease in) public services prove to be additional instigators of conflict (Ahlbrecht et. al, 2009: 22). All of the formerly mentioned components suggest an incapacity of the state, in a situation like this one would refer to it as a collapsed state, which fails because it is convulsed by internal violence and can no longer deliver positive political goods to their inhabitants. Their governments lose legitimacy, and the very nature of the particular nation-state itself becomes illegitimate in the eyes and in the hearts of a growing plurality of its citizens (Rotberg, 2003: 1). A collapsed (weak) state is thus characterized by its inability to provide capable governing institutions which exert judicial power, ensure personal security, deliver schooling and medical care, provide economic opportunity and remain legitimate. Without such guarantees it is rather easy for insurgents to control large areas of a country with no fear of repercussion, and it becomes easier to recruit members by providing them with better economic opportunities than they would attain while remaining within the legal system. It is apparent then, that a lack of state capacity directly fuels and extends armed conflict. Usually coupled with state failure comes economic inequality - which is an important issue when analyzing conflict, as it can not only exacerbate armed conflict but also extend it. Economic exclusion is a major factor to consider when explaining expansion and persistency of insurgency (Nasi, 2006: 223). According to Marxist thought, wars are caused by class struggle, this is not to say that poverty or economic inequality inevitably cause war or civil unrest, but that it is a major element in generating revolts and legitimizing armed conflict. Weak economies are accepted in the literature as factors that generate war (Miall et al. 1999: 108), and unequal economic chances are seen as root causes for conflict (Ahlbrecht et. al, 2009: 29). Moreover, economic and social deprivations appear to be important in unleashing rebellions (e.g. the civil wars in China and Cuba). However, even though it is widely agreed that economic problems and discriminatory economic systems are underlying causes of conflict (Ahlbrecht et. al, 2009: 29), the causal correlation between poverty and war seems to remain unclear. In other words: “whether poverty increases the likeliness of violent conflict or whether violent conflict leads to sustained poverty, has not yet been resolved by academia” (Podszun, 2011: 37). What is clear however is that war usually harms the local economy and causes massive physical, economic and social damage. In addition, in cases relating guerrilla warfare, the government usually responds with military attacks, therefore increasing military spending. Some claim that military spending is economically beneficial because it provides jobs, permits federal governments to target areas that need financial investment and generates demand that can stimulate a lagging economy (Barash and Webel, 2014: 239). In contrast, many experts agree that military spending is damaging for the economy – to name a few, it is argued that the same fund spent for civilian purposes would generate more jobs and that it causes inflation (Barash and Webel, 2014: 239-240). In addition, an increase in military expenditure has shown to be directly linked with an increase in external debt (Smyth and Narayan, 2009: 247) which thus only adds to the impoverishment of the land. Moreover, not only does an increase in military spending create inflation and external debt, it is also likely to produce what is commonly known in cognitive political studies and international relations as the “security dilemma”. This depicts a situation in which the actions of one actor, most likely a state, intended to increase its security (e. g. increasing military strength or making alliances), can lead other actors (or states) to view these acts as a threat and respond with similar measures as a means of “protection” (Booth and Wheeler, 2008: 1-2). It creates thus a spiral model that produces increased tensions that generate and exacerbate conflict, even when no side really intended/desired it. In summary, strong levels of economic inequality within a country may lead to unrest and discontent thus creating the basis for revolutions or aggravating already existing armed conflict, but there is little evidence that it directly leads to war. Evident is though that “internal militarized conflict has disastrous effects on developing countries” (Podszun, 2011: 37). In addition, military spending might damage the economy and intensify the fighting when perceived by the opposing side as a direct threat. In addition to inefficient states and economic inequality, corruption has been identified by scholars and practitioners as a major obstacle to peace building efforts. Understood as “the political ascendance of naked- self interest”, corruption “intensifies social inequalities, encourages social fragmentation and internecine conflict and propels a corrupt society into an unremitting cycle of institutional anarchy and violence” (Theobald in Le Billon, 2003: 202). It does so by (further) impoverishing the country and damaging the private sector as it leads to a poorly equipped education, medical and electoral system. Additionally, it undermines justice and economic development by distorting the distribution of public goods, and destroys public trust in leaders and governments. All in all, there is robust empirical support that corruption increases the likelihood of large-scaled violence (Neudorfer and Theuerkauf, 2014: 1857). It does so by diverting the resources away from their economically optimal uses and so, obstructs growth and development. Also, it intensifies economic grievances among marginalized groups, which subsequently leads to a reduction of the opportunity cost of violent rebellion (Le Billon, 2003: 202). Due to the mentioned effects generated by corruption, state legitimacy is undermined and thus its effectiveness compromised; this in turn complicates the state´s capacity to manage and resolve social conflicts; and fuels violence due to political, economic and social grievances that can not be properly managed due to a weakening in security institutions (Zaum and Cheng, 2012: 62). Herbst (as cited in Le Billon, 2003: 202) notes that these “institutionalized and discriminatory patterns of revenue allocation make the distributional process vulnerable to factional pressures and shifting political agendas, which in turn might precipitate violent attempts to change these policies”. Furthermore, a study by Leite and Weidmann (1999) and more recent studies (Aslaksen, 2007; Petermann et al. 2007), have found that natural resources in the form of fuels or minerals tend to, on average, increase corruption (Kolstad and Wiig, 2011: 6). This has vast implications as it indicates a cycle mechanism in which the existence of natural resources both incites corruption and fuels armed conflict. A potential causal explanation for this may be that natural resources incite corruption, corruption then causes all the formerly mentioned effects which lead to violent conflict, and finally the existence of these natural resources helps rebels finance their insurgency, thus extending the dispute. As can be seen, there are many factors playing out in multiple levels that either fuel the conflict, extend it or flat out hinder peace negotiations. The elements that have been analyzed up until this point do not directly try to, or have a specific interest in, threatening and/or stopping peace negotiations; spoilers on the other hand, do. They are generally defined as “leaders and parties who believe that peace emerging from negotiations threatens their power, worldview, and interests, and use violence to undermine attempts to achieve it” (Stedman 1997: 5). This definition is expanded in this thesis in order to include non-violent actions as spoiling may sometimes be a by-product of other activities or structural issues that are not necessarily violent but which´s outcome might complicate the negotiations, and peaceful- resisters who also aim to damage the negotiations. Spoilers can range from participants in the negotiating table, guerrilla members, and military members to structural issues such as the fragmentation of a guerrilla group. Stedman (in Gray, 2009) differs between inside and outside spoilers. The inside spoilers are parties and actors that are part of the dialogues and show a disposition to reach a peaceful solution – so long it seems to benefit their cause. As the negotiations go on however, these inside spoilers fail to fulfill key obligations of certain agreements. These types of spoilers must thus conceal any opposition whilst maintaining “offensive-military-capability” (Gray, 2009). This is one of the primary reasons why rebels seem reluctant to lay down their weapons until everything seems to be safe for them. So that, in the moment when the negotiations show signs that could disadvantage the group or advantage the opponent, they can continue remain in battle. On the other hand, outside spoilers are those who are – for whatever reason - excluded from the negotiations, and have reasons to fear peace. They are not only excluded from the talks (which means they are denied a platform to air their grievances), but this exclusion also potentially means that there will be a lack of representation for them after a settlement has been reached. These actors usually carry out spoiling actions when the discussions (in which they are not allowed to participate), seem to threaten their legitimacy, power and/or ideology (Gray, 2009). Aggestam (2012: 319) notes that precisely this exclusion of some parties from the negotiating table may trigger spoiling actions. Spoilers thus, have a great power in threatening to derail peace processes, and they many times succeed. The identity of spoilers is very context-based and may change numerously over time. It is however of paramount importance that peace negotiators be aware of potential spoilers and have respective spoiler management techniques – on this depends the success and implementation of peace agreements. There are three strategies for spoiler management as proposed by Stedman (in Ryan, 2000: 41): inducement, socialization into a set of norms, and coercion; these relate to specific spoiler types. Stedman differs between three different spoiler types: a limited spoiler (who has very specific and limited goals), a total spoiler (who demands total authority over a situation), and a greedy spoiler (an in-between with flexible goals). He argues that inducement (taking positive measures to address complaints of groups that might want to hinder peace) may work for limited spoilers, whereas socialization may be an applicable long term strategy for greedy spoilers. In the case of a total spoiler however neither of these tactics will work, according to Stedman, because the spoiler views the war in all-or-nothing terms; in this case the use of force might be necessary. The involvement of third parties may be both beneficial and damaging to peace talks. The literature typically suggests that it is a positive element to bring into the negotiations as it proves to be a reliable method of maintaining impartiality by providing neutral monitoring and ensuring that commitments are held. A typical role of third parties is to act as a mediator which basically refers to an entity or person facilitating negotiations through a pacific, non-coercive and non-binding approach (Podszun, 2011: 71). There is a high correlation between the participation of third parties and peace talks´ success rates (Armengol, 2013: 1). Barash and Webel (2014: 239) list various ways in which the input of third parties can be favorable for negotiations. They mention that third parties can act as intermediaries or they may be able to provide a neutral ground for the negotiations to take place. Jahn (2012: 43) explains this concept further by writing, that it seems rather hard to achieve peace in a modern, internationalized society without cooperation, because peace is no longer attainable through sole spatial and social separation. Also, pressure can be applied - high ranking representatives can, for example, threaten to cut off economic or military aid unless some of the proposed compromises are accepted – which thus tends to speed up the negotiation process. Similarly, powerful countries may “sweeten the deal” by providing economic aid or similar assistance while underlining certain prospects of the deals. Moreover, institutions, such as the United Nations, may act as fact- finders by establishing commissions of inquiry to evaluate conflicting claims (Barash and Webel 2014: 239). Another way by which third parties contribute constructively to peace negotiations is by acting as mediators or arbitraries by, for example, making suggestions that might be agreeable to both sides. This is a valuable asset because the same suggestion that is accepted when suggested by the third party may have been rejected when made by the opponent out of fear that it can be interpreted as a sign of weakness (Barash and Webel 2014: 239). There are however other scholars/authors who view this topic more critically and encourage analysts to asses the motives of these mediators, in other words, to observe with what interest and at what time they intervene (Podszun, 2011: 95). Others even note that the involvement of third parties might bring incentives for spoiling in terms of resources, recognition, and favoritism to one or the other party. Other times, third parties may play into the hands of spoiling by projecting the idea that any form of settlement is a priority and thus raising opportunities for aid from international donors that spoilers may come to see as an end in itself (Neumann and Richmond, 2006: 5). Also, combatants may fear the consequence of settling through a peace agreement because it creates the opportunity for the stronger side to exploit its future position. Fearing this, the belligerents will be reluctant to lay down their weapons or sign a deal unless there are credible third-party security guarantees (Walter in Svensson, 2009: 452). It is therefore very important for this specific aspect, especially if there has been a history of failed security guarantees, that the government shows in a believable manner that it will abide by joint agreements and implement costly reforms. Furthermore, these security concerns need to be addressed in both short-term and long-term perspectives. Their potential negative effects on peace building and peace implementation processes may be immediate and linked to a long-term horizon where, for instance, the leaders of warring factions are persecuted by national or international tribunals. This is a very plausible outcome because their access and control over violent means is still significant – which makes their ability to destroy any previously agreed upon institutional settlements very high (Mezzera et al. 2009: 32-33). In short: one must not ignore the spoiling potential that come from the security fears of combatants. Nonetheless it is also of crucial importance to find a balance between security guarantees for the rebels, and justice. For example, by guaranteeing freedom from prosecution, the security of the belligerents can be enhanced thus making it more attractive for rebels to lay down their weapons and cease fighting (Svensson, 2009: 453). However, granting amnesty to the perpetrators of atrocities and, in addition, not touching upon restorative measures for the victims may “provoke resentment and may start a conflict spiral” (Pruitt and Kim in Svensson, 2009: 453). A more apt way would be to implement a restorative justice to enhance the reconciliation process. The literature indicates that there is a linkage between the durability of agreements and the participation of civil society in peace negotiations. Civil society interventions help to create a prosperous environment, aid in shaping the agenda and the negotiation periods, and make it easier for certain topics to be addressed. Additionally, they can help bring greater public representation into the negotiations. The absence of such voices and interests can therefore negatively impact the sustainability of a peace agreement. Some researchers however warn that civil society organizations are sometimes neither neutral nor uniform in the advocacy for peace agreements and some have specific agendas that actively oppose peace agreements (St.John and Kew, 2008: 14). Nevertheless, civil society involvement plays a great role in the realms of reconciliation as it can help reduce the barriers of popular resistance against the reintegration of rebels into society. “The irrationality of violence and the psycho-social effects it inflicts, do not just come and go. They become part of the everyday of what Pierre Bourdieu has called “habitus””(Fetherston, 2000: 195). As Fetherston mentions, it is very hard for a society that has suffered horrible human rights abuses to forgive and forget and peacefully accept a reintegration of rebels. Without members of the civil society actively working to reduce the barriers surrounding reintegration, it would be rather difficult to create sustainable peace. If reconciliation does not take place, to a degree, the reintegration of ex combatants will not be effective and will hence push them back into criminality. However, civil society alone can not be the agent behind reconciliation. Justice also plays a great role. There are two forms of justice, briefly mentioned above: retributive justice and restorative justice. Retributive justice is about holding perpetrators accountable and creating different forms of punishment whereas restorative justice involves repair and reparation for damage done to the victims which thus involves measures to restore the social fabric of society by compensating the victims of atrocities. It is widely believed that restorative justice is more likely to lead to reconciliation and that retributive justice, which is tightly linked to amnesty, may decrease both the chance for conflicts to end through negotiated settlements and the chance that those settlements stick – if agreed upon (Svensson, 2009: 453). Original quote in German (author‘s translation): „zunächst wichtig, den Konflikt unvoreingenommen als sozialen Tatbestand zu betrachten und be Definitionsversuchen den “Konflikt” (a) nicht mit Austragungsformen zu verwechseln; (b) nicht durch Bewertung einzugrenzen und damit dessen Anaylse zu präjudizieren; (c) nicht durch seinen Kontext unnötigerweise auf Merkmale zu reduzieren, die seiner Komplexität nicht gerecht werden und (d) nicht mit seiner Ursächlichkeit zu vermischen…Konflikte lassen sich entsprechen definieren als soziale Tatbestande, an denen mindestens zwei Parteien (Einzelpersonen, Gruppen, Staaten etc.) beteiligt sind, die auf Unterschieden in der sozialen Lage und oder auf Unterschieden in der Interessenkonstellation der Konfliktparteien beruhen".